Finding appropriate windows has not been easy. 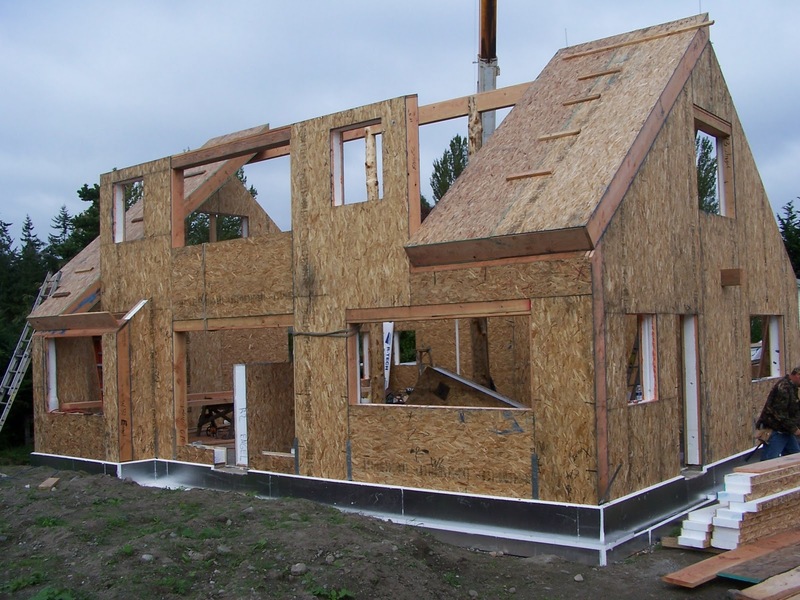 The usual sources (Andersen, Pella, Milgard...) do not make sufficiently well insulating windows to allow Passive House certification. We considered Serious Materials and one Canadian source which was more expensive. German windows are available and top of the class, but not in my budget. We finally went with the fiberglass frame Serious windows. The hard part to swallow was the cost which was about $50/sf based on rough opening - $19k for 16 windows. By comparison, you can buy vinyl frame windows at Lowes for about $15/sf and double pane low e fiberglass frame windows for about $30/sf. So why have windows? Well, it's useful to be able to get light into the house, and to look out of the house, particularly if you can look at trees and the sky as opposed to your neighbor's walls. Can you have too many windows? Yes, because windows are not as well insulated as walls, the floor, and the roof. Heat leaks out of the house in a number of ways, and a major pathway is windows -especially after the sun goes down. However, there is a big positive potential to windows, namely, in the daytime, they can harvest light from the sun and convert it to heat. So the goal is to maximize light harvesting and to minimize the losses from the windows that don't collect much light and from all windows at night. In the heating season, the sun is low in the sky, and although it seems hard to believe, if your house were in the form of a cube with the area of all sides being equal, more light would hit the south face than the roof. So the obvious rule ought to be to carefully orient your house to the south, and maximize the window area in that direction. Take a walk around your neighborhood and see how many houses have been designed that way. You won't see many. Maximize the window area to the south, minimize the area to the north, where you will not harvest sunlight and have intermediate values on the east and west sides where you have some light harvesting, but significantly less than to the south. On my house, there are 363 sf of windows including the glass doors. 167 sf are on the south side, 81 on the west side, 71 on the east side, and 45 on the north side. The images at the top of this posting show (from top to bottom) the east, south, west, and north sides. Each window must give values for 3 numbers. The U value where U = 1/R is a measure of the insulating strength. 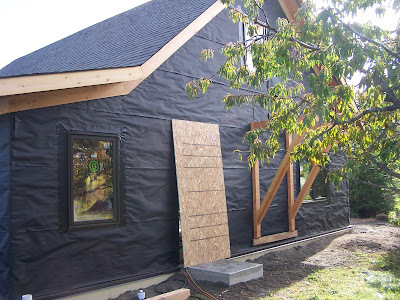 The solar heat gain coefficient (SHGC) measures what fraction of the sunlight is harvested, and the transparency measures what fraction of the light incident on the window enters the house. There should be a fourth number that is a measure of air infiltration, but disclosing that number is voluntary, so it’s not done. Ideally, you want U to be as high as possible on all windows. It varies between 0.14 and 0.20 for my windows. The lower numbers are for Serious 925 series windows, which have 2 glass layers and two polymer film heat mirrors, which is equivalent to quadruple glazing. These windows are expensive, and we have them on the east and west sides of the house. We used the 725 series which have 2 glass layers and one polymer films on the north and south. Both series have krypton gas as a filler The SHGC should be large for the south windows (it is 0.50), smaller on the north windows (it is 0.21) with intermediate values for the east and west windows(~0.40). Ideally, you want the transparency of the windows to be high, but that is incompatible with large U values. How can one harvest sunlight? Sunlight enters the house as visible light, but leaves as infra red light. Efficient windows are coated with materials that have a high transmission for visible light, and a low transmission for infrared light. You harvest sunlight by allowing the visible light to enter, but making it hard for infrared light to leave. The coating reduces the transparency, which varies between 38% for the north windows, and 65% for the south windows. Given all these variables, how should one choose window area, U values, etc? That was Jesse Thomas’ responsibility, and he relied heavily on a software program from the Passive House Institute that allowed him to vary window area, U values, etc and calculate the energy usage by the house. The inputs to the program included detailed average local weather information throughout the year, and a lot of the details on how the house was constructed. He did a cost-benefit analysis of using 725 vs 925 windows and came up with the final window design. The performance numbers are interesting. 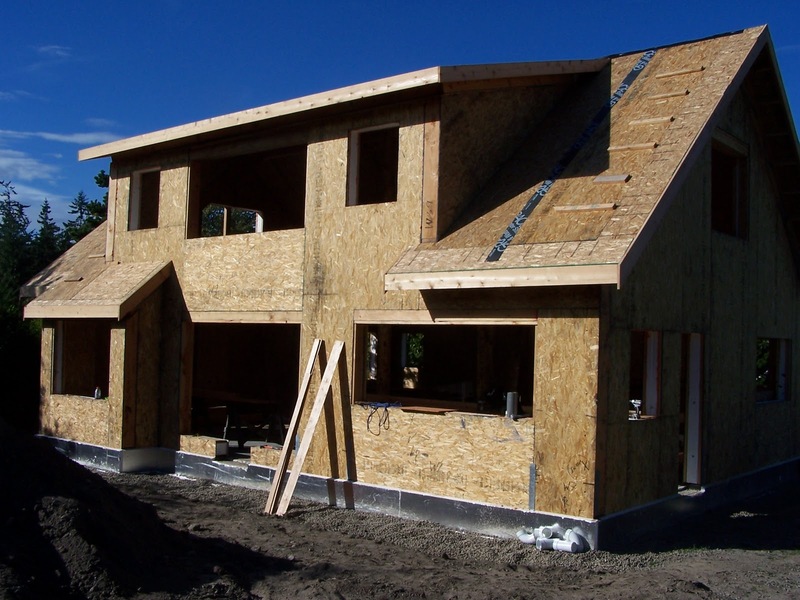 41% of the heat loss from the house goes out through the windows, even though the windows are only 8% of the surface area of the house including the slab and roof. 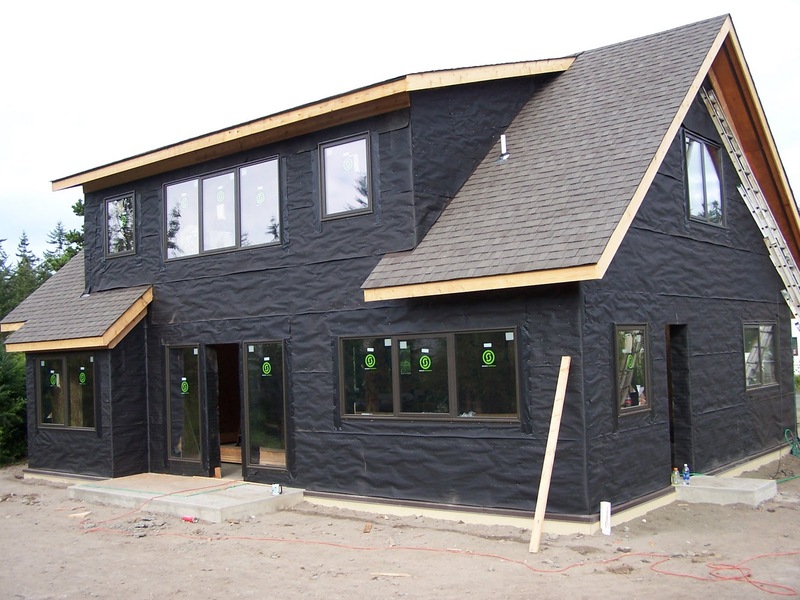 However, 47% of the energy needed to operate the house comes from harvesting sunlight . So the windows are doing their job, allowing in natural light and passive heat gain. Importantly, we have more gain than loss from the windows. 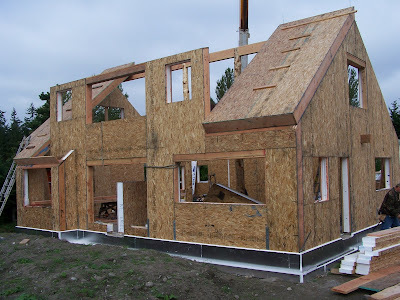 To say this differently, if we had left out all but one of the doors and all windows and lived in the highly insulated space, we would need more energy than having the somewhat energy leaky windows and doors. However, without the expensive windows, the energy loss would be significantly greater than the gain. 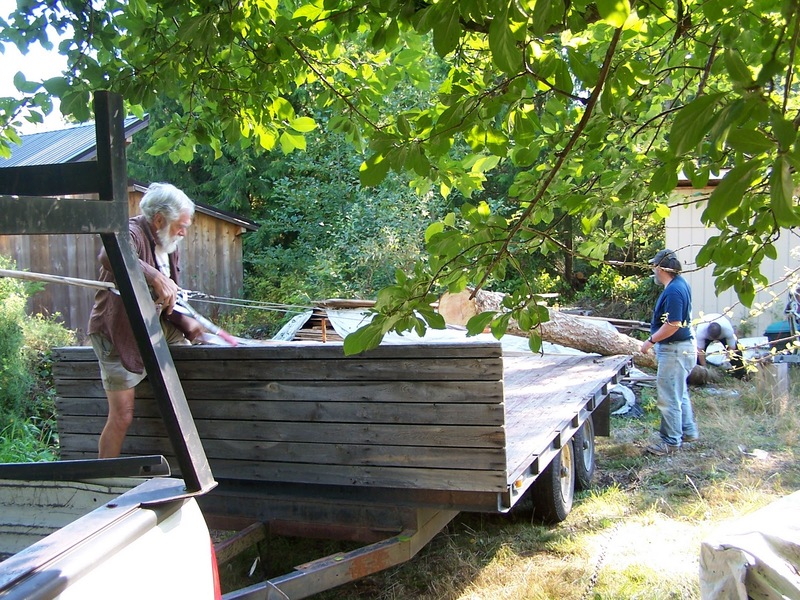 Before the roof panels go in place, we need a ridge beam, which is supported on two 21' high fir logs.The top picture shows us hauling the logs onto a trailer using a come-along. We got five, of which 2 will support the roof over the front porch. 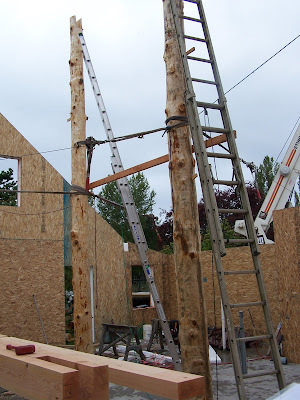 That was a good morning's work.I peeled them at the site as shown in the second picture, and two posts were hoisted in place using the crane. 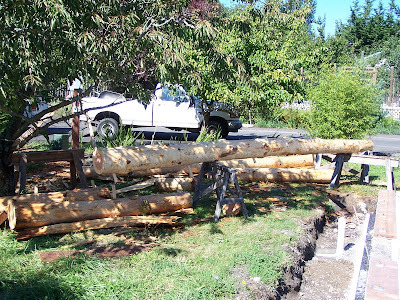 In the lowest image, the ridge pole is placed on the log posts. 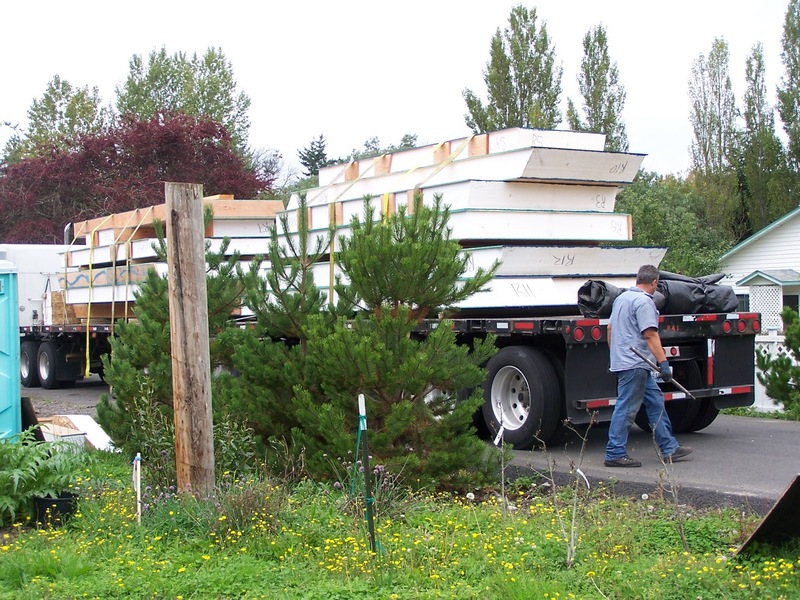 On day 30, the roof panels arrive. They are unloaded in an hour or so, and the first panels on either side of the dormer the go up the same day. 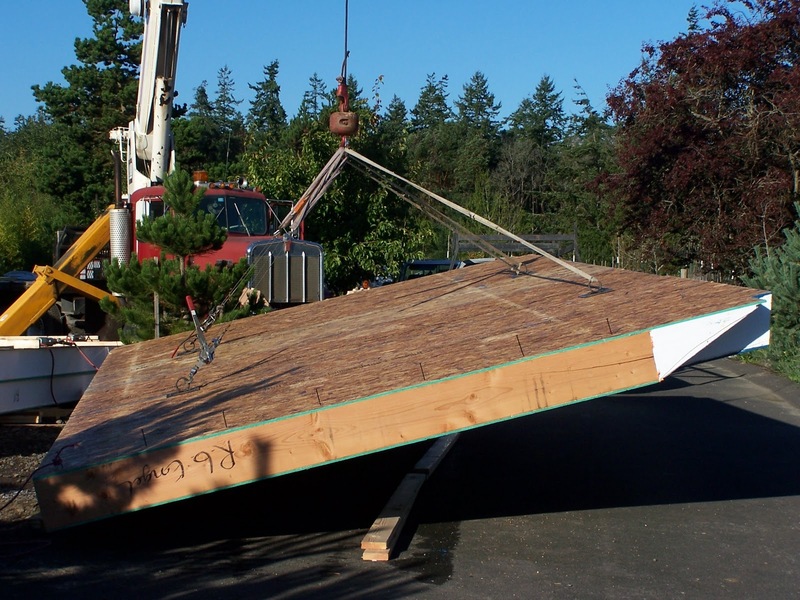 The fourth image below shows the dormer roof, which was put together from smaller panels on the ground. The come-alongs seen in the left of the image allow the tilt to be set so that the panel comes down with the same clearance everywhere. In the fifth image, it is being set in place. The sixth image shows a short log post being slipped in before the roof is shut. All roof panels are in place on day 34. 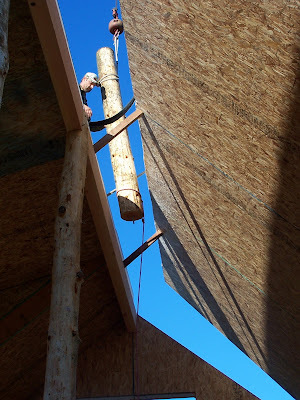 The last image shows the added on eaves. The 12" roof would be too thick to extend out as eaves, so we had to add on eaves built with 2 x 8s. 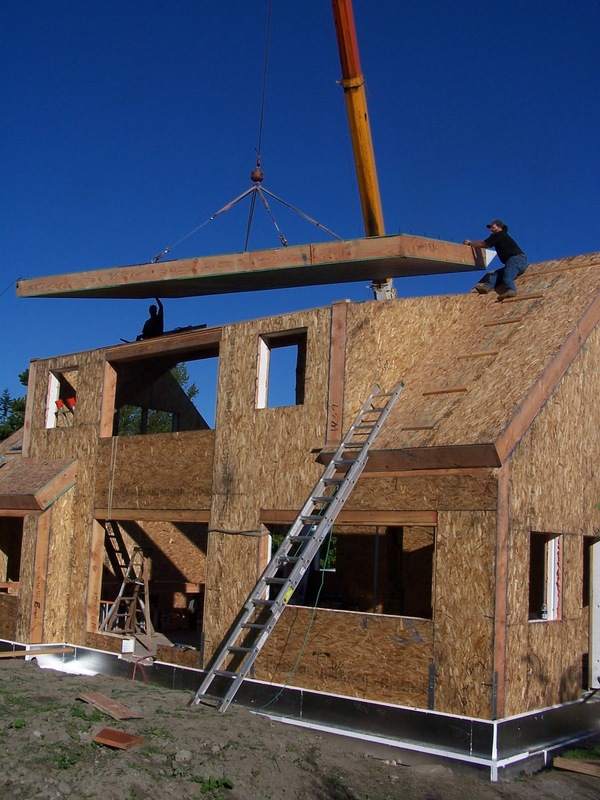 So how are we doing with the cost and how does it compare with a more conventional house? 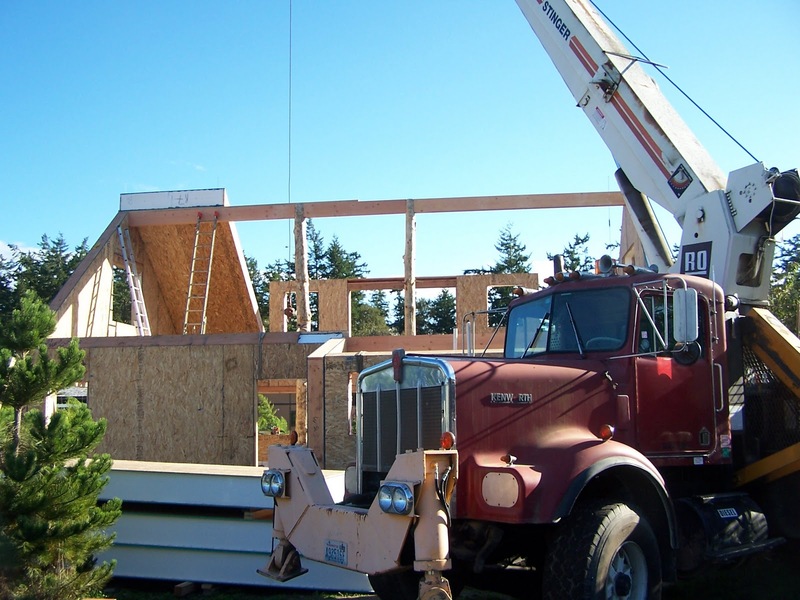 The wall and roof panels cost $33k, including the crane rental, sales tax and delivery. 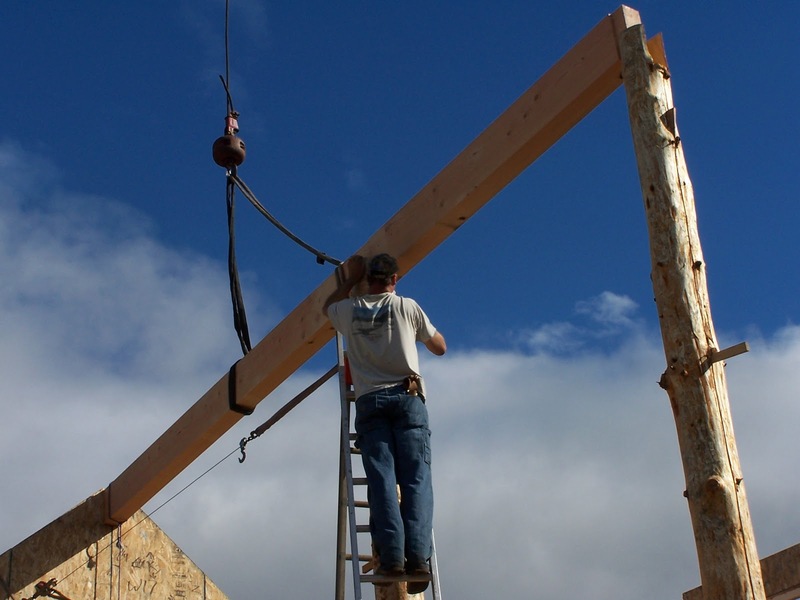 It took 3 men 8.5 days to put them up plus 2 days for the eave construction. Counting workers comp, social security, etc and the 8.4% sales tax, the labor costs for putting up the walls and roof were $6.2k. 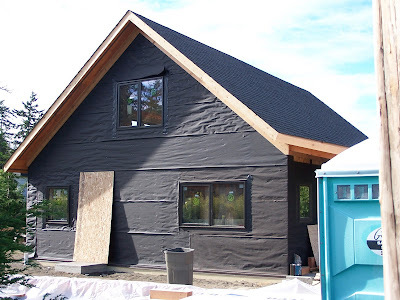 Total cost of the fully insulated shell is ~$40k. One of the contractors I interviewed priced out conventional framing and sips for this house. 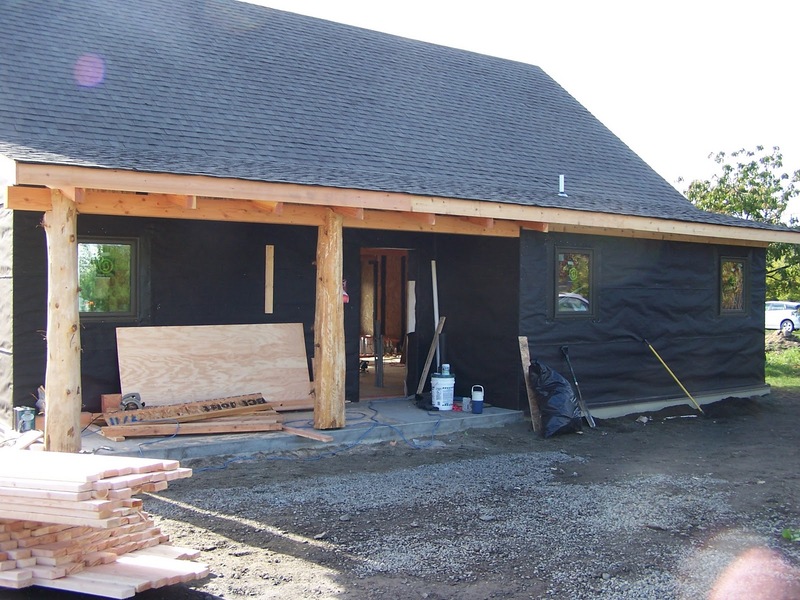 The labor would have cost ~$5k more, and the insulation would have cost $12k. The total cost was identical to within ~$2k.